I am super excited, SUNDAYBLOG finally got a new dress. I have been looking forward to it for so long, yet never really knew how to do it. I feel extremely lucky I got the support of elf acht, a Hamburg based front-end expert, designing templates and individual WordPress-Themes. Not only do I love what I see now, I also know so much more about WordPress and all its opportunities, that I feel comfortable adapting and improving things in the future. 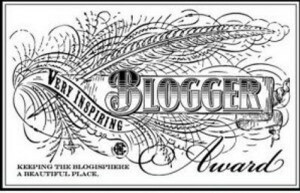 So to all of you out there, who have a blog and would love to pimp it… here is my recommendation! Since I also moved domains, you as a follower have to sign in to the new domain to stay updated and receive the posts to your inbox every Sunday. I would be more than happy if you continued to join SUNDAYBLOG in it’s new home and dress. Before traveling Brazil, I had actually never heard about Pantanal. It is one of the world’s largest wetland areas situated in the state of Mato Grosso do Sul in the west of the country, extending into Mato Grosso, Paraguay and Bolivia. We booked a room in a fazenda (farm house) and stayed there for 4 nights. 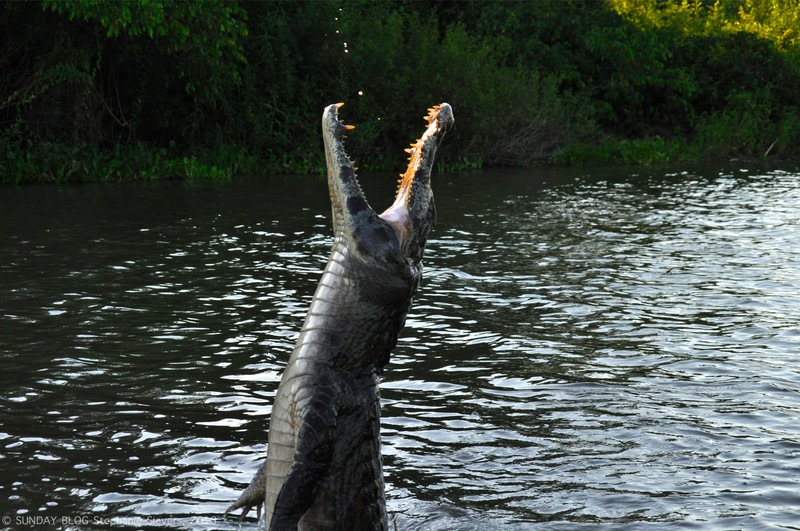 Pantanal is a pure experience of both, adventurous and calm nature. Tucans woke us up in the mornings, we went Piranha fishing and fed crocodiles in the wild, saw rare blue parrots and many more animals. Not only did we go on adventurous “tourist trips”, we also went horse back riding with some cowboys to experience their daily work with the cow herds. It’s such a different life from back home and I was more than happy to get off the horse after a three hour trip. Not only was I scared of my horse, but also of the cows, staring at me with their frightnig horns, while we were riding through the herds. While we were staying in the southern Pantanal near Miranda, the “Arena Pantanal” is situated 800km north in Cuiabà in the geographical center of South America. Constructions were finished in 2014 and will host 4 matches during the FIFA World Cup 2014 providing space for 45.968 people. Ohlsdorf Cemetry surprised me most of all the cemetries I have seen around the world. Until recently I did not know, that the world’s largest cemetery is just a bike ride away from my place in the north of Hamburg, Germany. When my friend asked me one day ,if I would like to join her, riding there with our bikes and I felt it was a really akward idea, since I felt I’d rather go to a park or the sea on a sunny day instead of a cemetery. Yet, what I experienced, once I was there, was overwhelming. Not only due to the size of the park (391 hectares with 12 chapels over 1.5 million burials in more than 280,000 burial sites and streets with a length of 17 km) but also since I had never seen a cemetery with public transportation (two bus lines with 25 bus stops). Ohlsdorf Cemetry is not only used as a burial ground, but also as a recreational area, so we met people riding on their bikes or even jogging through the park. The atmosphere was absolutely unique, since somehow it connected life and death in a very respectful and natural way. It has got many impressive mausoleums, huge rhododendron bushes, ponds and birds, sculptures and although about two million people from all over the world visit the cemetery every year it was a quiet recreational place. So if you live in Hamburg, it’s a must see and if you ever happen to travel to Hamburg, make sure, you put this experience on your list. You will be touched, inspired and very fulfilled afterwards – I promise. A couple of months ago, I attended a TEDx Event in Hamburg, where I listened to the inspiring talk of Sydney Alfonso. Sydney was born in New Mexico, yet moved to San Francisco a couple of years ago. She was amazed by the handcraft talent of the native American women in her home area making jewelry and wanted to find a way to promote their talent by delivering access to international markets and thus financially and socially empower these women. She funded etkie, a social jewelry company, partnering with Kiva, providing business opportunities to the native women to preserve their rich and diverse culture. Etkie is an online sales platform, that helps underserved women sell their products at fair prices to earn a higher income and eventually attain financial independence. Through this blog post I want to reach out to all my readers in more than 100 countries to support Sydney launch a new wrap collection and continue on this amazing journey with more artisans! She has just started an Indiegogo crowdfunding campaign to collect 20.000 USD for this important next step. The Indiegogo community has already funded an amazing 10.000 USD. If you are interested in supporting these women and want one of these beautiful unique bracelets, check out the campaign HERE. Overlooking the Port of Hamburg at night, has always been a treat to me. It’s as if I had thrown a coin in a miniature toy machine where all of a sudden everything starts to move. The closer you look at it, the more things you will discover. A huge restless area, following it’s own rules and rhythm – hypnotizing anyone looking at it. Watching the sun set from one of the beach bars across the river, as the sun colors the sky and then the lights color the port mirrored in the river Elbe is simply precious. The Port of Hamburg is the third biggest port in Europe (after Antwerp and Rotterdam) and the ninth biggest in the world with 10.000 ships steering in per year. With a turnover of 139 Million goods in 2013 it is connecting 950 harbors in 178 countries, providing work for 156 000 people. The 7200 hectare of the harbor include 140 km of street, 304 km of railway tracks, 130 bridges and 12 km of beach along the river. It’s Europe’s biggest port of importation for coffee, the world’s biggest trading and storing center for rugs and amongst the world’s leading trans-shipment centers for tea, cacao, coffee and spices. Founded on 7 May 1189 for its strategic location, it’s almost as old as Hamburg itself. Wanna know how to grow a pineapple by yourself? I can remember as if it was yesterday, the feeling of astonishment and amusement, standing in front of this pineapple field in Australia years ago, realizing … that these pineapples or not growing on a tree. I thought it was the most obvious thing, that pineapples grow on exotic palm trees. Surprise – things are not necessarily the way we think they are. 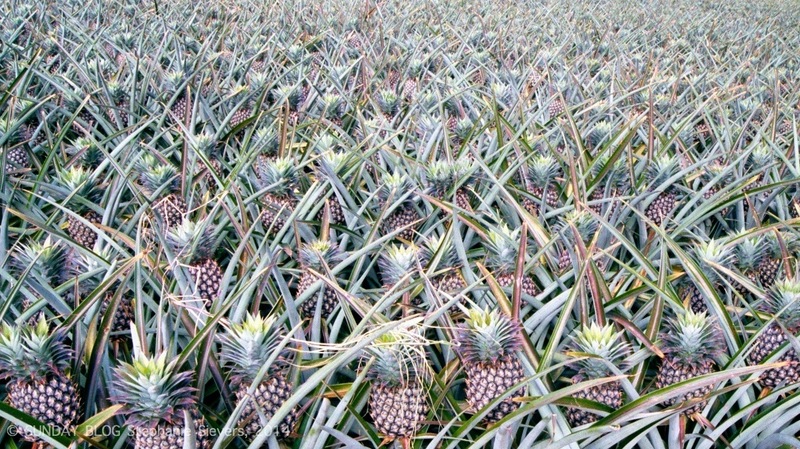 Pineapples are aggregate fruits, formed by a cluster of 100-200 flowers fusing together as the fruit. The squared eyes you can see when holding a ripe pineapple in your hands, is what is left from the individual flowers. The leaves sprouting out of the top are actually growing out of the top of the stalk, which the pineapple is growing around. Before I went to Majorca for the first time, I absolutely did not want to go. I expected it to be terribly touristic and “German-invaded”. Luckily, reality sometimes does not meet expectation for the good. Living in Majorca for 3 months for an internship years ago proved me entirely wrong. It is such a stunningly beautiful island: Antique houses built of sandstone, tiny villages, fields of orange and lemon trees, picturesque mountains and turquoise beaches. Yes, there are extremely touristic areas and you can avoid those easily. Before visiting Jaipur Foot with the Journeys for Change team, I was afraid of what I would see and how I would feel once we are there. With 1.35 Million produced artificial limbs, Jaipur Foot is the world’s largest producer of world-class artificial limbs, rehabilitation aids and other appliances to physically-challenged individuals below the poverty line. People from all over the country and even beyond go on a pilgrimage to this place to receive an artificial limb for free. We were the outsiders, walking in as visitors to see the poorest amputees sitting in front of the campus waiting to be able to walk out in a couple of days. Jaipur Foot is a non-profit organization, providing free prosthetics to every person arriving at their campus (often with a few last coins in their pockets). Every day the Jaipur site fits 60 artificial limbs. People arriving at the campus will wait 2 days on average until their limb is fitted. On top of the actual treatment, Jaipur Foot provides food, accommodation and often money for the trip back home (which most people could not afford). The idea to set up Jaipur Foot resulted from a traumatizing life-threatening accident, when D. R. Mehta, founder of BMVSS (Jaipur Foot) nearly lost his leg. Whilst he spent time in hospital, he thought about the fact, how his life would entirely change, if he weren’t able to pay for the treatment. Where would a poor person, losing a limb in an accident, by a land mine or by disease go to get an artificial limb? That was, when the idea started to found a non-profit organization for the poorest amputees to support them regain mobility, dignity and thereby making them a normal, self-respecting and productive member of the society. The beauty of Jaipur Foot is the lightness, innovative technique and its price. Due to its lightness people can walk, run, trek, swim, sit cross-legged, walk on uneven terrain, work in wet fields and pedal bicycles. In collaboration with Stanford University the Jaipur-Knee was developed and claimed one of the 50 Best Inventions of the world in 2009 by Time Magazine. Whilst a comparable artificial limb in the US costs 18.000 USD, a prosthetic of Jaipur Foot costs 50 USD. See the presentation of Joel Saddler, MIT and Stanford University student and Jaipur Foot engineer, at TEDx Jamaica about the Jaipur Foot technology and how it is impacting peoples lives. BMVSS is financially supported by the Indian Government (Ministry of Social Justice & Empowerment) and by private donors. Anybody who wants to donate to this project is more than welcome to do this here. Every 50 USD will provide a person in need with a limb to walk home with dignity. Since 1975 Jaipur Foot has provided 440.690 limbs, 363.973 calipers, 418.770 crutches, 87.851 wheel chairs, 23.967 hearing aids and 7.385 surgeries. It is operating in 27 countries (e.g. Afghanistan, Bangladesh, Somalia, Sudan and Sri Lanka). Take 8 minutes of your time to travel to the campus like I did, to feel the amazing life change Jaipur Foot offers, to learn about the simple as well as highly engineered technique of the limbs and to listen to the full hearted and dedicated founder Mr. Mehta. I have never been interested in carpets and that changed entirely, when I met Nand Kishore Chaudhary, founder of Jaipur Rugs, the leading manufacturer of hand knotted carpets in India. In 1978 he started the business with two looms growing until today to a company headquartered in Jaipur, operating across 6 states of India through an independent weaver base of 40,000, selling into 40 countries world wide. A case study of Jaipur Rugs in the book “The Fortune at the Bottom of the Pyramid” is stating it as an example of a social business which helps to tackle world poverty, as Jaipur Rugs has always worked with the so called “untouchables” and ignored the predominant cast system in India. Mr. Chaudhary has set up a business, where families would receive a certain design to create a carpet at their loom at home and then sell it to his business. He would then do the final work on the carpets and sell them to wholesalers. He has always related to the weavers and also learned from them. Through his business the weavers get regular carpet jobs and they are paid, what they were told. Beneath the business numbers and the success story, there is a story of ups and downs, of learning about the unknown, of courage, believe and happiness – “university of heart wrecks” as he calls it. I was impressed when I learned that he invested most of his money and a loan to enable his daughter to learn about American consumer behavior and households in the US and to study abroad, to increase sales to US customers. He had no clue about this country (as he had never been abroad), no idea of the return of this investment and no friends with a comparable experience to relate to. When we asked him, how he managed all the challenges of his business, he explained, that he realized, he made his decisions due to fear, desire and unconsciousness. Looking behind the scenes of each of those helped him to better understand his thinking and eventually make better decisions. When we went to the showroom, I could not believe the beauty of the carpets. Those designs where modern, colorful and simply impressive. What I saw where not just carpets, but artworks which could have been presented in an art exhibition. It was touching to have talked to the families producing it in the very remote villages. He has created a business, which becomes a social business since he includes people in the loop of it, which are excluded from society. His happiness, generosity and love towards life and people create an incredible culture and atmosphere in the entire company. So true, when he said: “Love is the biggest thing, it opens a door and it opens potential.” Especially in business we tend to forget about that – or we might even be afraid, to open up like he does. Listening to him made me feel like listening to my grandmother, since I did just not want him to stop talking about life, people and business in his incredibly humble, wise and joyful way. After graduating from an elite university in India, a man called Bunker Roy, did not start one of the many careers waiting for him, but started working with the poorest in the villages of India, to understand their needs. In 1972, Bunker Roy started a college, called Barefoot College to educate the poor. What the poor thought was important would be reflected in the college. The college would accept cop-outs, wash-outs or dropouts willing to work with their hands and skilled to support the community. Bunker Roy changed the way people look at professionals. You are not necessarily a professional if you have a certificate, but when you know how to actually create something. So he started to educate illiterate people how to become an architect, a dentist or a solar engineer. One of his projects is to teach grandmothers from all over the world how to build solar panels at a 6 month workshop at his Barefoot College. After the workshop the grannies go back to their villages, the villages get solar cells sponsored by the Indian government and the grannies will be the solar engineers capable of repairing. It’s such a disruptive experience and it’s breathtaking to see the strength of these grandmothers. They have usually never ever left their country and never met anyone outside their village. They dare to leave their village for 6 months, get on a plane to a country they might have never heard about, with a language they don’t understand to become a solar engineer. Change is about education, yet education is not only about certificates, but about the things you are capable of doing. A different very smart project he started are the Barefoot Night Schools. Since the kids have to support their parents in the fields during day time, there is usually no way to go to school. He tackled this problem with Night Schools, where over 75,000 children were educated until today after dark – for sure with the support of solar light. At these schools kids are tought about democracy, citizenship, how to measure land, what to do if you’re arrested or what to do if your animal is sick. To help the kids understand society he started a Kids Parliament which would elect a Prime Minister. The Prime Minister is in charge of monitoring and supervising 150 schools for 7,000 children. The Prime Minister would write a postcard to Bunker Roy in case he or she could not solve a problem by himself or herself. It was one of these postcards, which resulted in a teacher’s lay off, since he did not come to school regularly. Bunker Roy is an incredibly smart man with disruptive ideas and the passion and courage to start something different. In 2010 he was selected as one of the 100 most influential personalities by Time Magazine for his work in educating illiterate and semi literate rural Indians. I highly recommend to take 18 minutes of your time to follow his ideas and achievements in changing mindsets with Barefoot College listening to his TED talk below. d.light is a for-profit social enterprise and the world leader in affordable solar light power products for the developing world. Charging d.light’s solar lights during the day (even on a cloudy day) will provide light for an entire night. In 2004, during d.light co-founder Sam Goldman’s Peace Corps service in Benin, Africa, his neighbor’s son was badly burned by an overturned kerosene lamp. This incident, along with the knowledge that 2.3 billion people in the world still do not have access to reliable electricity, inspired Sam to participate in a class called Entrepreneurial Design for Extreme Affordability at the Stanford Design School, where he met co-founder Ned Tozun. With Journeys for Change we visit the d.light HQ in Delhi and learned that d.light has improved the lives of over 28 M people, reached over 7 M school kids and created 9 BN “extra” hours for studying and working. Also, we went to a village and saw, how the product was introduced and sold to the poorest, who had never seen anything like that before. d.light has set up a smart cooperation with a microfinance NGO (BASIX) who supports people financing the lamp and also works as local sales team in the villages. The cheapest lamp at 8 USD is still unaffordable for most families. GOONJ is a social enterprise based outside Delhi in India, using utilized clothing and other material as a tool for social change through the project CLOTH FOR WORK. As lack of clothing is still one of the biggest problems in rural areas leading to suffering, humiliation and often death, GOONJ distributes 1000 tons of material and clothing per year. They collect utilized clothes and material, separate good items from broken items and recycle those into something new. A business thought of Anshu Gupta, founder of the company, that really impressed me, is to charge people in the currency they have. People in rural areas are able to do tremendous work with their hands and create projects, which improve their lives. Therefore GOONJ does not ask families to pay for the clothes in cash, but through working on a project, which the local community considers as most needed like bamboo bridges, schools or water tanks. The social need, which struck me most, since I never thought about it within all my years of traveling poor areas around the globe, is the need of clean sanitary pads. I could not believe, that I as a women myself, had never considered this monthly issue. Women end up using all kinds of rags leading to infections and even death. The shame and silence associated with the issue makes it the most taboo subject even among women. GOONJ leads a project called NOT JUST A PIECE OF CLOTH where instead of introducing a new product, they create napkins out of those pieces of clothing that can’t be used and create a special type of “sanitary napkin”. GOONJ has distributed 2 million of the world’s cheapest sanitary pads in the past and continuously educates women in this subject. Traveling remote areas has always been a hobby to me and business was on a different page. Many times during my travels, I felt the urge to support people I met in remote villages without access to the very basic needs like clothes, electricity or health services. I have always admired people who had the courage to start a business from scratch, even more, if the intention was to create social impact. This is why I chose to go to India with an organization called Journeys for Change, which connects business professionals from all over the world with social entrepreneurs in India. This blog is followed or read by people from over 100 countries, who are mostly interested in traveling and different cultures. I have the feeling many of the readers are also interested in taking some part in making this world a better place. I will share the insights I got meeting these great entrepreneurs and learning about their business models over the next couple of Sundays to share the amazing inspiration I was privilege to receive. There are these big world-known monuments we have seen on postcards, magazines and TV many, many times. Golden Gate Bridge for sure is one of them. So when I went to San Francisco, I was so excited to see it “live”. This picture captures the first time I saw Golden Gate Bridge and I can still feel the goose bumps I had all over my skin. It was a quiet moment as the sun set and it felt as if the sea gull and I shared this very special moment, looking at a far. The Golden Gate Bridge is named after the straits of waterway known as the Golden Gate. There are different opinions on whether the pathway was named Golden Gate due to the Golf Rush in California or the Greek word for harbor in Istanbul, Turkey. The “red” color of the bridge is the famous international orange, used as a sealant for the bridge. Initially it was meant to be colored grey afterwards, but because it fit perfectly to the landscape and people liked it a lot, it stayed that way. Today was one of these days, which just makes up for any cold, rainy or cloudy day. Icy river, blue sky, fresh air and a picture perfect sunset at my beloved harbor. Just lovin’ it. Let’s laugh more often, more intense and for less reasons in 2014! I met this lady in Bagan, Myanmar, where she wanted to sell some clothes to me and a friend of mine. While we were having fun bargaining, I captured her beautiful and whole heartedly laughter during the talk. When I think of Myanmar, I think – despite of its beautiful landscape and pagodas – mainly of its people. Although it is a very poor country, Burmese are very joyful and would start most situations with a smile. They enjoy their newly gained freedom and are really loving and living life with a big curiosity for new things and education. Thinking about 2014 New Year’s resolutions, I felt above all the “being a better person”, “quit bad habits” and “pushing yourself to new limits” I should simply consider to laugh more often, more intense and to worry less. I wish all of you a wonderful start into 2014 hoping, you use more situation to have a great laughter and to have your friends around you to share these moments. Also – for the not-at-all-fun-times – I hope you surround yourself with people who cheer you up again, giving you back the ability to see the good and fun things in life. I want to thank everyone supporting me during this year and especially those of you somewhere out there in this big world, keeping up my motivation to write this blog. Isn’t it funny, that is a special thing if a species stays together for a lifetime? It seems as if humans and animals are becoming more alike in this aspect in recent years…. Macaws, which belong to the parrot family mate for life. Not only would they breed with their partner, but also share food with their mate and enjoy mutual grooming. 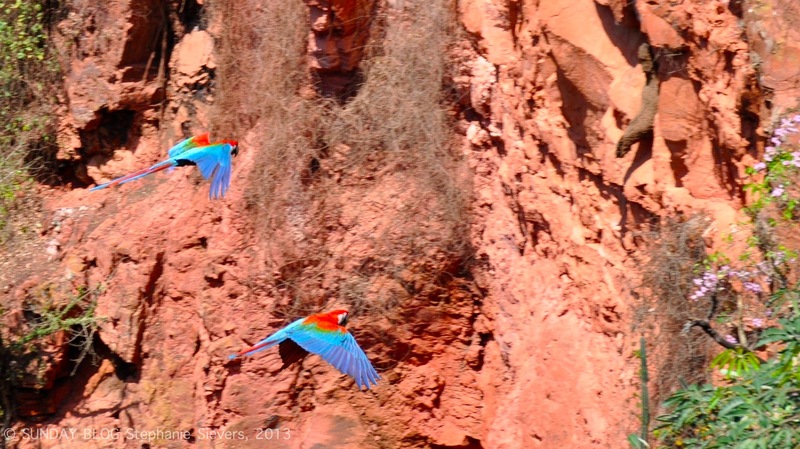 I love this picture as it shows a couple of colorful Macaws flying together freely and independently through a crater in Bonito, Brazil, during midday heat. Such an adorable feeling.